EasyCare Boots, Clinton Anderson/Pete Ramey Video and Hoofjack Equals Natural Hoof Care ! EasyCare has added some excellent quality products with our line of horse boots. These products compliment our great boots and add to the must have items every horse owner should own ! The Clinton Anderson video features Pete Ramey discussing and showing the natual hoof trim. The Hoofjack is a real handy item to have, especially if you have a bad back, bad knees, or anything that would restrict you from handling your horses' hooves. Even if you don't trim hooves yourself, you could be teaching your horse to stand still when using the Hoofjack and make your hoof trimmer enjoy coming to your place because your horse is accustomed to the process. You do the training, spend quality time with your horse and end up with a happy trimmer that can concentrate on your horse's hooves, not a training issue ! Visit our website to see the special offering in the month of May on the Hoofjack. Get one while stock is available !!!!! What is Equine Cushing's Disease? Equine Pergolide Action is previously posted on our blogs and it pertains to a medication for Equine Cushing's Disease. In order to understand why Pergolide is very important, you should understand the disease. What is Cushing's disease? This disease is caused by a small non-malignant tumor located in the marble sized gland at the base of the brain. This gland (pituitary gland) is responsible for regulation of hormones and other chemicals to control body functions. A horse with Cushing's disease usually develops this condition in the mid to late years of life; however it has been sometimes diagnosed in horses as young as seven. What are the symptoms? The most common symptoms are: (1) Sudden and extreme thirst. The horse may drink 4 times more water a day then an average horse. (2) Abnormal hair growth and shedding. The hair may be heavy, coarse, and curly and does not shed in the summer. (3) Swayback stance and a pot belly. (4) Chronic laminitis. (5) Lethargic, sweat easily and tend to run high temperatures. Owners of Cushing’s horses have a wealth of information and support at their fingertips. One such resource is the Equine Cushing’s discussion forum at Yahoo Groups. Topics include diet balancing, special nutritional needs, medication sources, laminitis (prevention, diagnosis and treatment) and research studies to benefit Cushing’s horses. A couple of us from EasyCare will be at the Equine Affair in Pomona, California February 1st through the 4th. If you are going to be attending, come visit us at our booth! We will be in building 8 section 873-879. We will be more than happy to help you with sizing, fitting, show you our new products for 2007 and answers any questions you may have about our products! This is an article from the local newspaper about the Equine Voices Rescue & Sanctuary, which is located in Green Valley, south of Tucson Arizona. If you received a new saddle for Christmas but the old one is still good, why not donate the old one to Equine Voices Rescue & Sanctuary? Call 520-975-7007 for more information or for pickup of the equipment. The horse rescue group is seeking donations of used tack, saddles, boots, blankets, feeders and any horse related equipment to sell at a fundraiser on March 3rd. All donations are tax-deductible, and donors will receive receipts. Equine Voices is a non-profit organization dedicated to saving Premarin mares and foals from slaughter. These are mares used in the production of hormone-replacement therapy drugs for women. Want to help out a rescue or organization closer to you? Click here for other websites. The air of heaven is that which blows between a horses ears. The new EasyUp Buckle has passed our testing program and will be ready for sale soon. The EasyUp buckle is the Easyboot buckle of the future. It fastens in the “UP” position, offers many cable adjustments, is easy to open and close, has easy cable adjustments and stays secure after fastening. Upgrade your boots to the EasyUp Buckle System. Either install yourself, or ship your Easyboot or Epic back to us for installation. The EasyUp Buckle will be compatible with the Easyboot, Easyboot Epic, and the Easyboot Grip. It will also be available as an option on our new Easyboot Custom program (More on the Easyboot Custom program will be announced soon). 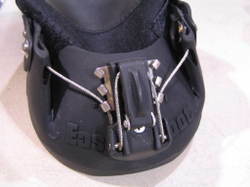 The EasyUp Buckle system will be available early 2007. 2006 Hoof Boot Contest Winners! We are pleased to announce the list of winners in the 2006 EasyCare $10,000.00 Hoof Boot Contest which ended on November 30, 2006. These riders did a great job and worked really hard to achieve their successes and we're really proud of them. They completed rides ranging from the Tevis Cup, the NSW State Championship 100 and 5 day 250 mile multiday rides like Bryce, Grand Canyon and Shahzada. Dave Rabe finished first in the contest two years in a row and has this to say about using boots on his now barefoot horses: "The Easyboot Epics and Bares that I used this year worked better than I ever imagined possible. They were excellent and worked really well for my horses. I had my shoer trim my horses every few weeks. This was way better for my horses, their hoof walls are stronger. The boots were a lot easier to use than I thought they would be and they held up extremely well. I never had any problem with the gaiters all year. I thought the Bares were awesome, no worry about buckles. My horses travel just as well in the boots as they do with shoes on and they are much better off being barefoot. My horses are kept in a 10 acre pasture with some rocks and they do just as well barefoot as they did with shoes on. Thanks EasyCare for having the hoof boot contest! I think your boots are the best thing on the market by far and haven't seen anything even close." Information on the 2007 Contest: EasyCare will award a total of $10,000 to the riders who complete the most American Endurance Ride Conference (AERC) or Australian Endurance Rider Association (AERA) miles during the 2007 AERC ride season (Dec. 1-Nov. 30) using two or four EasyCare hoof boots. Throughout the year special promotions and discounts will be made available to those participating in the EasyCare Hoof Boot Contest. Entry forms and more information can be obtained at this link. Here are some photos of a few hoofboots that have found alternative careers. Everything from being a planter, wind chime or pencil holder to a wine glass holder, even a baby cradle! EasyCare will have the new Easyboot Custom Program ready to roll in January or February of 2007. The new Easyboot Custom Program will allow consumers to develop a hoof boot for their horse and their trail riding conditions. This exciting new hoof boot system allows anyone to custom design a horse boot to fit any specific need. Choose the fastening system, pick the tread pattern, determine the back strap system and designate the size to create the boot that’s right for your horse. The Easyboot Custom program will be available through the EasyCare website only. Please allow three weeks for delivery. All custom boots will be shipped FedEx directly from our manufacturing partner in Asia. Each Easyboot Custom will be $75.00 regardless of size or custom selections. As the Easyboot Custom program develops we expect to add choices of color for the shell, Gaiter, Backstrap and buckle components. More info will be available after the first of the year. Here's a little Christmas Cheer! Merry Christmas and a Happy New Year from the Staff at EasyCare, Inc.
Did you know this about your tree? EasyCare will be closed from December 20th-January 2nd. We will be back in the office ready to go on January 3rd. EasyCare has been closing the office for the past several years over the holidays. This break gives everyone at EasyCare the time to spend with family, friends and horses. The two weeks is a wonderful break and lets us start the new year rested and refreshed. Have a wonderful holiday from everyone at EasyCare! EasyCare, Inc. will be closed for the Holidays December 20th through January 2, 2007. If you are looking to purchase an EasyCare product there may be a dealer near you that is open and has just what you need! Click here for a list of dealers in your area! 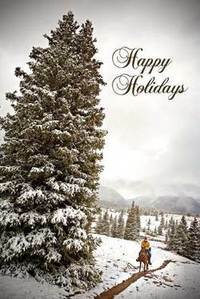 The staff at EasyCare wishes everyone a safe and happy Holiday Season! As the Christmas holidays quickly approach remember that EasyCare has quick and easy on-line shopping capabilities. Take a look at our secure shopping cart here. Yahoo just released a recent poll showing that three out of four holiday shoppers will purchase gifts on-line. 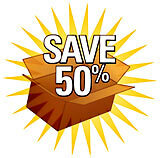 Free shipping and secure sites were the biggest considerations for shoppers. Take a look at the Yahoo poll here. I'm going broke with these boots but really glad I found your page. Anyway, I have Old Mac's Gen 2. My horse seemed to love them. We used them on some rides, and then went on a longer one. He started complaining about 3/4 the way. I walked, wondering what could possibly be wrong. Removal of the boots showed discoloration of the heel bulbs - like bruising. The hoof wall fits well but the bulbs seem to be setting hard on the materials in the rear. Wondering if I need the cushion inserts or to move on to the bares. A. Are you using the Old Mac Pastern Wraps? The wraps will give you extra cushioning and protection of the pastern area and heel bulbs. Does your horse have low slung heels? You may need to take that in consideration when measuring. When you stated that you went on a longer ride, how long of ride did you go on? We use 25 miles as a measuring point. If you ride less than 25 miles per ride/week, I would recommend the Old Mac's or the Boa Horse Boots. The reason is that these boots are higher profiled boots (coming up to the hairline) and may cause rubbing or chaffing on longer rides. Otherwise, the Easyboots, Easyboot Epics or Easyboot Bares may be a better choice. They are lower profile boots with all the hard parts of the boot below the hair line, therefore eliminating any change of rubbing or chaffing. Gaiters need to be tight, but even so, horses with thinner or sensitive skin can sometimes experience rubbing with the gaiters. Here's an easy fix if your horse has this problem. I have been looking at your Bare boot. I have to keep a few boots on hand for a couple horses that can have laminitic episodes. They have cushings. I was told that the Bare boot might be to soft for a laminitic foot. Is this true. Please give me your opinion. I have used the Epic boots more on sole sore and laminitic horses more than the Bares. I most always use some of the Easycare comfort pads inside these boots and have really liked how comfortable the horses are with them. Regular easy boots with pads can also be used, but it's nice to have the wrap-around velcro material at the pastern like the Epics have to hold the boots on better....these boots really stay on nicely. Since you're looking for boots for these occasionally sore footed horses, I think the Epics will be more flexible and more user-friendly for you.